It’s that time of year again when we start to think about Thanksgiving and all the other holidays that will follow. My first reaction is a positive one, thinking of all the things I am thankful for this year and every year. But then, my thoughts immediately turn to the amount of preparation and events that I must get through, added to my already loaded schedule. Help! The positive thoughts immediately turn to negative ones as I envision endless to-do lists, dealing with crowded stores, decorating, cooking large meals, running to all types of parties, children’s concerts, entertaining relatives and spending tons of money take over my thoughts. Talk about exhaustion! There has to be a better way to manage all of these extra tasks without losing the joy that the holidays represent. After some research and thought, I have come up with some ways to get through the holidays with a smile. We all have our daily routine that keeps us grounded and moving forward. If we steer too far away from that routine, our stress levels increase. This year, try to keep wake-up times, meal times and bed times as close to normal as possible. If most of your days are routine, the ones that aren’t will not affect us so harshly. 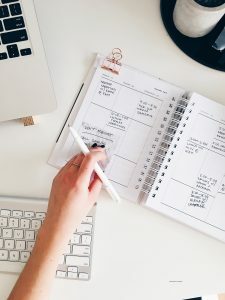 Sit down with your calendar and try to schedule shopping, cleaning and decorating time blocks around your normal tasks, leaving some flexibility for unknown invitations and events that occur. If you have out-of-town family or friends who will be staying with you over the holidays, prepare your home so they can easily help themselves to breakfast and lunch. Have shower needs readily available like towels and shampoo so they do not need to ask. Print out some information about activities they may want to do while you are at work or handling other commitments. Maybe they will take your kids with them on an excursion. Imagine, you may actually have some free time alone to sip a hot beverage, gaze at the tree and listen to your favorite holiday tunes. I am relaxing already just thinking about that scene. 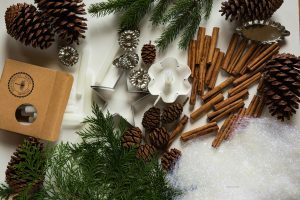 We all have visions of the “perfect” holidays which are created from holidays of our past as well as photos and stories we see in magazines and on television. While it would be wonderful to achieve all of those goals, it is not worth the price you pay to do so. Sit down and figure out what parties and events are non-negotiable, and what can be considered for another year. Say “no” when you are being asked to help out at yet another holiday event that you know will push you over the edge. A sincere regret is enough. Throw any guilt out the window. Plan time to do simple things like watching the local tree lighting in your town or driving around the neighborhood to see the lights and decorations. These are the types of things that create joy. When it comes to decorating your home, remember that not every inch has to be decorated. Your home does not have to look like the ones on “The Great Christmas Light Fight” on TV. Choose a few of your favorite decorations and put those up. A lovely wreath, a sparkling tree or menorah will create a warm holiday glow. Thanksgiving and holiday meals do not have to be banquets. Prepare a menu covering the basic favorites, always being mindful of dietary needs of your quests, so everyone can enjoy. Don’t feel bashful asking guests to bring a dish to the meal. It will cut down on your work and allow you to sample other people’s family favorites. Whenever possible, prepare food ahead and freeze to reduce the stress on the actual day. The main focus is to enjoy a meal together with loved ones and to remember the meaning of these holidays. Less food will also help avoid the holiday weight gain when you step on that scale in January. The holidays can bring on many mixed emotions. Many people feel lonely because they do not have family near or have gone through a recent divorce or loss. Combat that loneliness by asking friends over for a “Friendsgiving.” Donating time to helping out at a soup kitchen or other volunteer work is a great way to alleviate feelings of sadness by helping others in need. Getting together with family can bring memories of past disappointments, rekindle sibling rivalries, or drag us back to old childhood patterns where we feel like we are children again. If these patterns start to emerge, walk away for a few minutes and remind yourself of the person you are now. If a family member is “pushing your buttons”, try not to allow them to succeed. Step away and talk with someone else who has your best interests in mind. It is absolutely essential to take special care of yourself at this time of year. 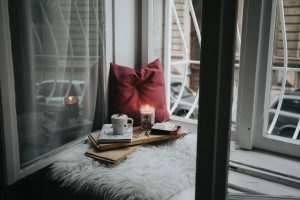 If you are feeling blue, pamper yourself with a mani/pedi, spa treatment, a 15 minute nap, a walk outside or curling up with a cup of hot chocolate and a good read. These are all ways to disconnect and have some pleasure. Getting run down from lack of sleep, rich and fatty foods and being around crowds for hours in hot stores can make you feel sick and miserable. That is certainly not how you want to spend your holidays. Be mindful of yourself, not just your family and friends, as it is your holiday too. The holidays are only a few weeks out of the year. In the famous words of the Grinch in “How the Grinch Stole Christmas” by Dr. Seuss, “Then the Grinch thought of something he hadn’t before! What if Christmas, he thought, doesn’t come from a store. What if Christmas…perhaps…means a little bit more!” Let your holidays be filled with joy this season.